While high ceilings can make a room feel larger and more open, they can be a challenge for designers to work with. The beauty of elevated ceilings comes at a price, however: poor acoustics. If you’re experiencing echo, poor sound diffusion or other acoustic issues in your space, there are several solutions to fix your acoustic issues. The easiest way to tell if a space has poor acoustics is a simple clap test. Stand in the middle of the room and clap your hands once. If the room is too live, you'll hear your clap echoed back loudly, usually with a distortion or twang to the echo. Perform the same test in a room with good acoustics, and you'll find that there is a less pronounced echo. The echo will sound very quick, as if someone clapped their own hands at the same time. If the space is large, be sure to perform the clap test in different parts of the room. Different ceiling heights and proximity to walls can affect the echo within the same room. The most effective way of insulating a high ceiling room from excessive sound reverberation is to address both wall and ceiling acoustics. The most common wall type is made of finished and painted drywall. The end result is a smooth, reflective surface that is going to bounce sound back into the room rather than absorb it. Bare walls reverberate sound very well, which only exacerbates sound control issues in a room with a high ceiling. 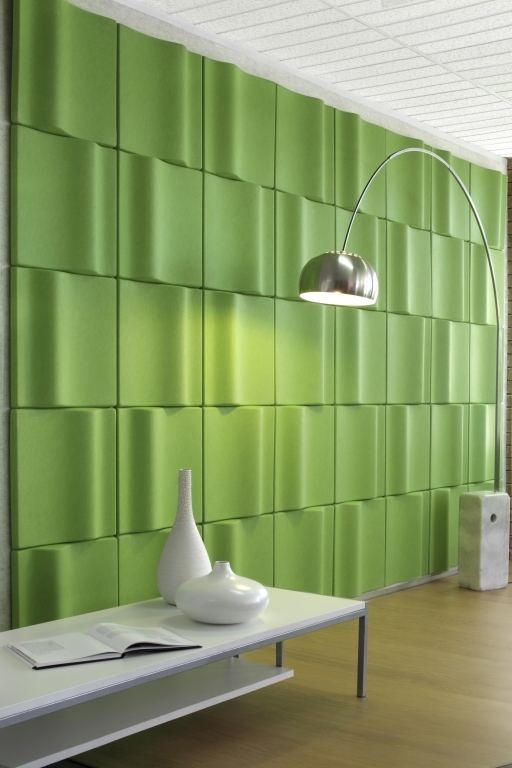 Cover the walls to reduce the amount of reverberation. One covering option is to hang wall art. Large decorative art, particularly pieces made of fabrics, canvas and/or wood, work well as their materials absorb more sound than pieces made with metal or glass. 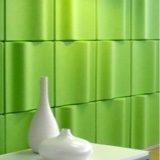 However, the most direct way of reducing sound is to use acoustic paneling or tiles on the walls. 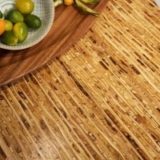 These types of products come in a wide variety of colors and styles to suit any type of residential, public or commercial setting. 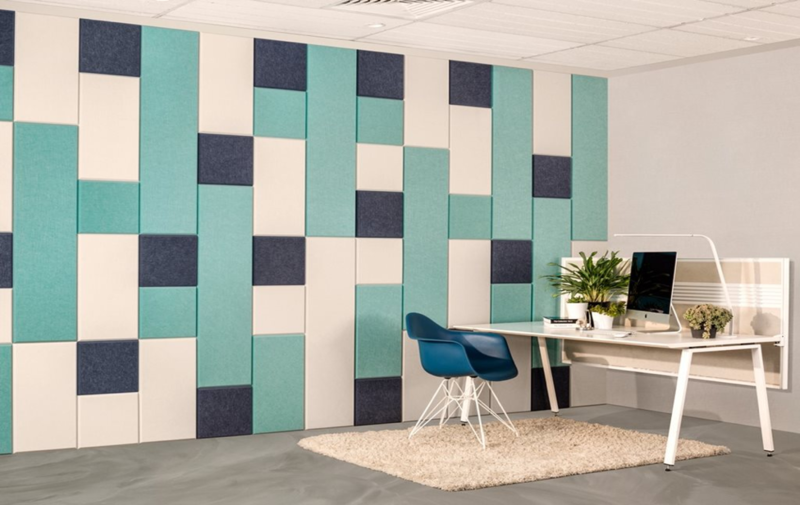 The primary benefit of using acoustic panels and tiles, rather than relying solely on wall art, is how much more effective they are at dampening sound. Additionally, if the room is designed in a minimalistic style, too much wall art can look unkept and cluttered. For a minimalistic room, you can use a product like EchoPanel Balance Tiles in a neutral charcoal gray. 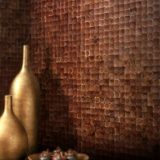 This will give you better sound control than any type of wall art, and the neutral tiles will complement the room rather than detract from it. Consider a flat ceiling to be the fifth wall in a room. Just as bare walls will bounce sound back into a room, a bare ceiling will do the same. Some common ceiling features such as hanging lights and fans will passively help to control sound. This might be enough for average-height rooms, but for rooms with a vaulted ceiling, you'll need extra help. Products specifically designed to control noise overhead can drastically help in busy places where noise is overpowering. 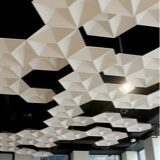 Most ceiling systems (standard drywall or dropped ceilings) can use a baffle design, such as the EchoSky. The EchoSky can be configured in numerous ways, making it versatile enough for nearly any building. If you'd like something more ornamental than a standard baffle system, the EchoCloud and the EchoStar are great alternatives. 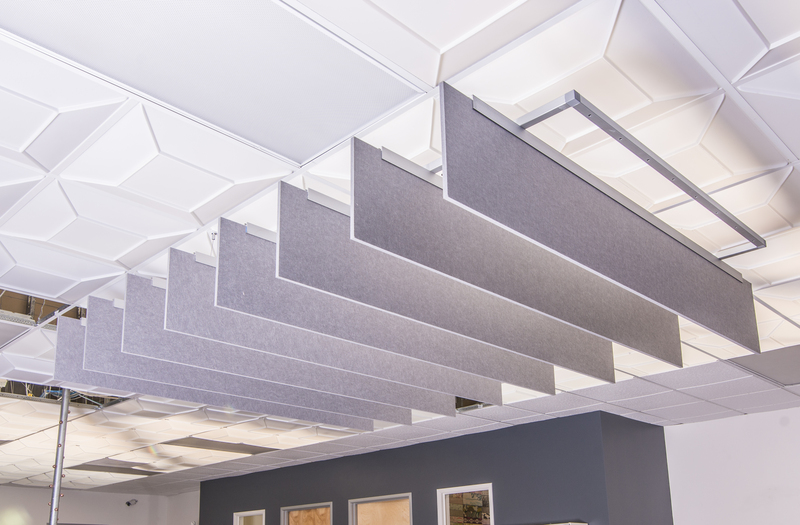 Both products perform very similar functions and have a suspended attachment, allowing them to "float" lower than a ceiling-mounted baffle system. Very loud environments, such as family restaurants and sports bars, are great places for installing suspended buffers. The only difference between the two products is their design. The EchoCloud has a minimalistic disc-shape, while the EchoStar has a dimensional diamond-faceted shape. The EchoCloud may be better for designs that have a lot of decor already present as it won't distract from the decor. The EchoStar would be great for a plain room that needs some style added. Buildings with high ceilings can be beautifully decorated while also designed in a manner that will control noise and produce good acoustics. 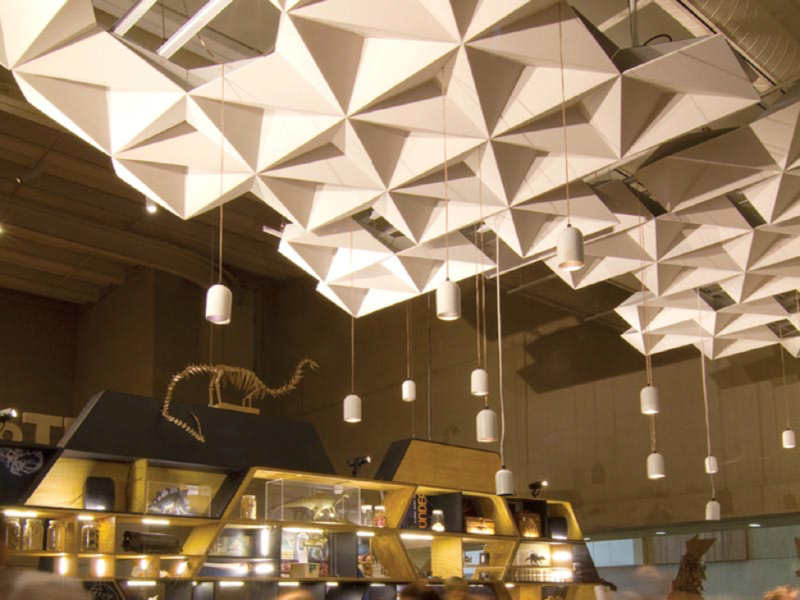 Incorporating noise control solutions, like ceiling baffles or wall tiles, should be considered a necessity, rather than a luxury, in public spaces. 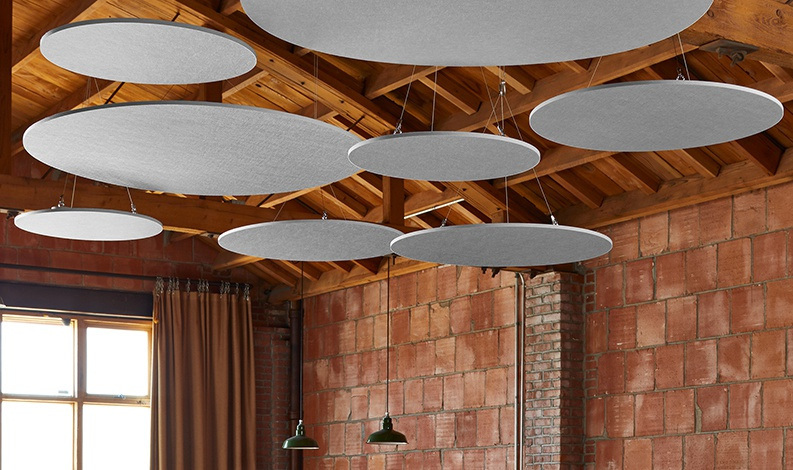 Solve your high ceiling noise issues by contacting a Kirei service rep to help you begin planning your acoustic remodel.